The Redbury hotel was the first hotel built in 1903 in NYC exclusively for professional women traveling alone. At a time when women needed permission from their husband or father to stay in a hotel by themselves, this hotel was revolutionary with many women investors. The “Women’s Hotel” also known as the “Martha Washington Hotel” was the headquarters for the Interurban Women’s Suffrage Council. For $1.50 per day and up women could rent a room with a private bath. Some of the original women still reside in their rent controlled rooms. Since the hotel was purchased in 2016 and rebranded as the Redbury each room was renovated with private baths and luxury amenities. The cozy rooms are painted red and decorated with collages of picture frames over the bed that nod to the “Women’s Hotel” history. Every room even comes with a modern gramophone which connects to your smartphone to play music. The hotel also is connected to the notable restaurant and bar Marta. 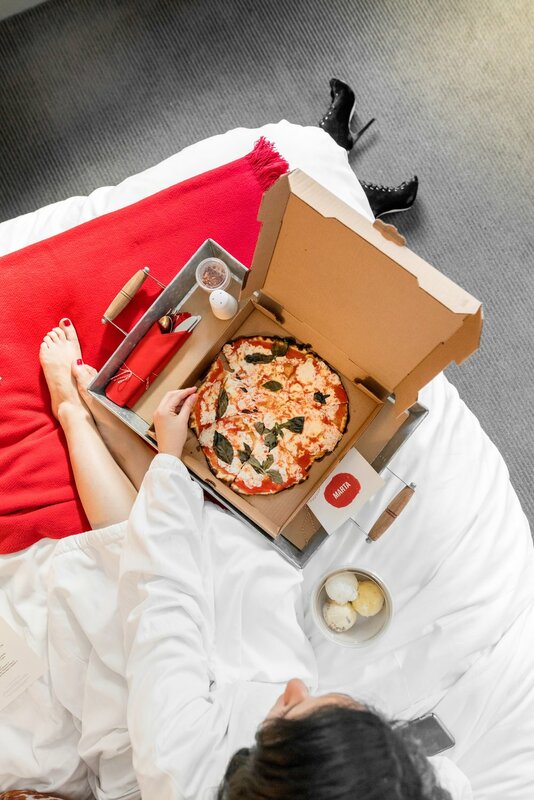 The best part of having Marta in the lobby was ordering room service thin-crust pizza and gelato as breakfast in bed (yes there are also breakfast items available). Note that a daily hotel facilities fee of $28 per room is applied to bookings which includes the High-speed Wi-Fi, digital access to The New York Times and The Financial Times, coffee service in the lobby, two bottles of water, New York Sports Club daily passes, printing and more. Location: In the heart of the trendy NoMad neighborhood, the hotel is a close walk to the best midtown attractions like the Empire State Building and Times Square but also less touristy areas like Madison Square Park and Union Square. It is also conveniently close to the 6 train and a short walk to the N and R trains. Check In: Through the red curtains and down the checkered carpet entrance the front desk check in was easy. Multiple employees were very helpful answering questions and had so many interesting stories from decades of working there under different owners and names over the years. The Room: The rooms can be cozy, but they are just what you need in New York and in the perfect central location to explore midtown and easily hop on a train uptown or downtown! Bathroom: Bathrooms were added to rooms later so they are all different shapes, some are smaller, but are renovated with all the newest appliances you might need like a backlit mirror. The room also comes with a good quality hair dryer (not attached to a wall). Bathrobes and slippers: The bathrobe was the kind you want to live in during your stay, with multiple soft plush layers of fabric with a towel fabric inside. The Redbury script “R” adorns everything even the hangers! Wifi: High-Speed Wifi was fast. Water: two bottles of water are included in the daily hotel facilities fee. Coffee/tea: The hotel facilities fee of $28 also includes daiy coffee service from 6:30am to 10:30am in the lobby. Power plugs: There were multiple outlets. Pool: There is no pool. Dining: Enjoy a thin-crust pizza at Marta, a Danny Meyer’s Union Square Hospitality Group restaurant. The restaurant is just across from the check in desk and can be ordered as room service to your room. Fitness: The hotel provides daily passes to New York Sports Club. Verdict: This is one of the cutest boutique hotels in New York with the richest history in the perfect midtown location. It is too crazy to stay in Times Square so this location on a quieter street a short walk from everything is ideal! I would recommend it and stay again as an affordable luxury hotel that sets you up well to paint the town red! This hotel looks beautiful and your red dress is stunning!